We specialize in the building of new dies, in spare die components, and in die maintenance and repair. There is no die, large or small, complex or simple, that we would be afraid to tackle. At Double M Machine, Inc., we realize that you do not want a finished die "dropped in your lap", so we work closely with you from concept to finished product. Our many years of experience working closely with our customers has assured us that this will generate the best dies for our customers. Send us a completed part print or even a rough sketch, and we will be happy to provide you with a quote. Using Autocad 2000 software, we can provide you with assembly and detailed drawings of our design. These prints will then be provided to you at job completion, so that you may order spare or repair parts with ease and convenience. We understand that you will expect a production run from our dies, and we will stand behind our product for a reasonable amount of time. We will work with you to configure the die to match your presses, operations, and determined production run. We also specialize in all sizes and types of fixtures for welding, machining and large-run production processes. Whether the fixture is mechanical, air-operated or hydraulic, we can service your needs. We excel at providing you with complete design and fabrication of your fixture, and can work with even the roughest of concepts. We are proud to have started out as a job shop, and have retained our abilities to produce even the smallest quantity orders. Although we have grown and expanded over the years to include many different machining processes and capabilities, we still do a large portion of our work in general machining. 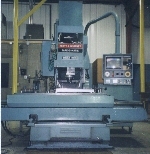 Whether it is lathe work, grinding or simple mill work that you need performed, please check out our equipment list. We are always happy to hear from every prospective customer, no matter how big or small. Proto-typing is available for most fabrications.